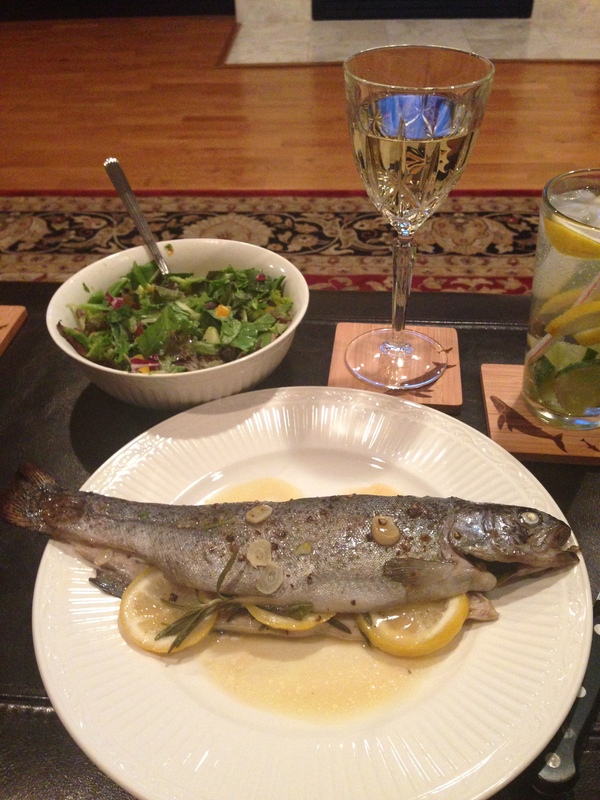 Fresh fish are something I consider an easy and delicious summertime meal. The key is preparation, then the rest is easy. 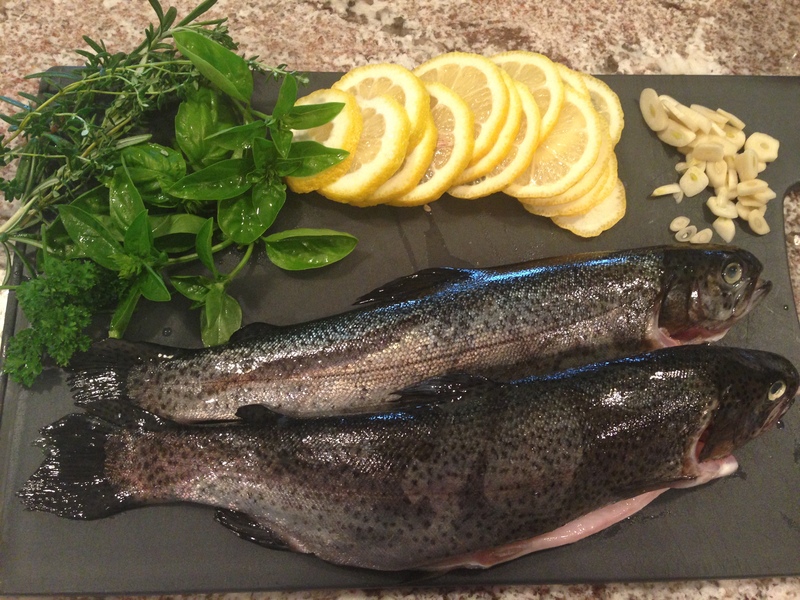 For tonight’s dinner I used whole trout that were pre-cleaned by the butcher, as I did not pull them out of the lake myself. I started by washing down the fish with cold water and patting dry inside and out with a paper towel. I opened the fish where they had been cut and sprinkled with a healthy dose of salt and pepper to start. For the filling: I lined each fish with a whole garlic clove thinly sliced, fresh herbs (rosemary, basil, parsley, and thyme sprigs cut from my patio garden), several thinly sliced lemons and finally a few pads of butter (or you can use olive oil). Since we don’t have a fish basket I wrapped the fish in aluminum foil set on a bed of thinly sliced lemon and topped them off with olive oil, salt, and more sliced garlic before closing the foil tightly. Putting them on a hot grill for 15 minutes is all it took to cook these guys through. No turning or flipping required. While the fish cooked I mixed together a simple side salad with spring mix, yellow tomatoes, cucumber, red onion, jalapeno, and avocado with a creamy balsamic dressing (I am currently in love with Briannas Home Style New American creamy balsamic). When you take the fish off the grill, you’ll find the bed of lemons allows the fish to come out of the foil easily, otherwise they will want to stick to the foil on the bottom and won’t be as pretty on the plate. 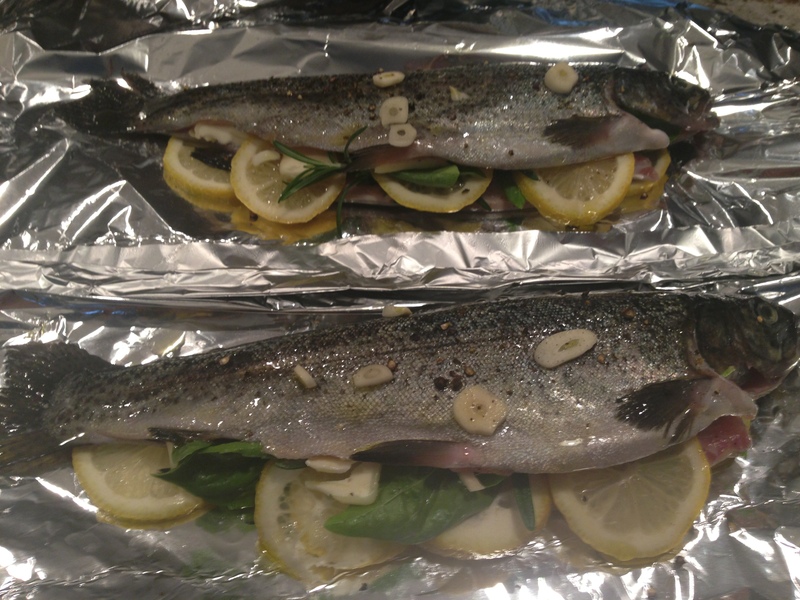 Don’t throw away the butter/oil mixture left in the foil, use that to drizzle on top of the fish once on the plate. For a variation tonight I prepared the fish with the same technique but filled with: salt, pepper, red pepper flakes, thinly sliced garlic clove, herbs (sage, rosemary, thyme), jalapeno slices, red onion, and lemon. Served with a side of roasted brussel sprouts with the residual butter drizzled on top. I have never cooked a fish like that with the head, eyes, skin, and tail still on! But I’ve heard that cooking fish that way adds a lot more flavor. Now I will have to try it!